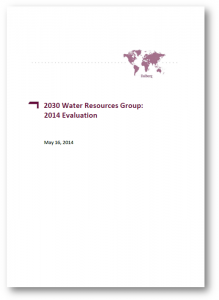 In early 2014, the 2030 Water Resources Group undertook an evaluation that delivered insights and arguments towards optimizing quality, steering and accountability of the platform and its deliverables. The objective was to reflect on its relevance, to determine its performance against expectations and to capture its efficiency, effectiveness, impact and sustainability. It will promote organizational learning and provide a source for evidence based decision making for enhanced strategic guidance, operational management and results orientation of the 2030 WRG in general. 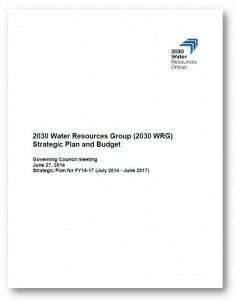 In particular, the outcomes of the evaluation informed the elaboration of the new Strategic Plan (July 2014 – June 2017) of the 2030 WRG. The evaluation was performed by Dalberg and was based on a desk review, three country visits and close to 60 interviews with a diverse group of stakeholders and experts including 2030 WRG staff, Steering Board and Governing Council members, sector experts, and representatives from the public sector, private sector, and civil society. Some of the concrete conclusions and recommendations were immediately addressed and incorporated in the new Strategic Plan and Budget. This plan was approved by the Governing Council in its 27 June meeting.